Preview: Cal looks to be in a position to make a move towards relevancy this season after going 6-18 combined in their first two seasons under head coach Sonny Dykes. It has been a complete rebuild for the Golden Bears over the past couple years and with 17 starters back this team is ready to take the next step. Cal showed tremendous offensive ability against weaker defensive units last season, but against teams like Washington and Stanford the Golden Bears averaged just 12 points per contest. The offensive side of the ball is where Sonny Dykes has built his success in the past and this team is primed to put up big numbers on this side of the ball in 2015. Cal was ranked 10th in the nation in scoring last season and they only expect to get better under rising star QB Jared Goff who’s already thrown 7,481 yards through two seasons. 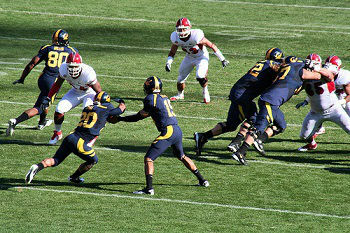 Cal is set at RB with 1,000 yard rusher Lasco back along with bruising back Enwere. Receiver is the deepest position on offense with headliners Treggs and Lawler returning. The Bears are also making strides on the O-line while building depth. Cal was a train wreck on defense last season and there deficiencies were only magnified in a conference that has some of the top offenses in the nation. The Bears are expected to be better this season with 9 returning starters, but it would be tough to be much worse. The D-line has been reformed with guys like Kragen, Wilson, and Forest looking to make an impact. LB should be steady with three returning players that have starting experience. The secondary remains the biggest question mark for the defense with 5 new recruits potentially stepping in for playing time while 4 safeties currently on the roster are dealing with injuries. Prediction: Expectations are much higher for a team that saw significant improvement last season despite still falling short of a bowl game. Making a bowl game has to be the benchmark for this team and if the defense can figure things out this could be a surprise team in the Pac-12. Look for Goff to put up huge numbers as he takes this team another step forward in 2015.